Malta Maritime Directory :: Approvals launch VIKING Nadiro into new markets, shorten delivery times. Comment about: Approvals launch VIKING Nadiro into new markets, shorten delivery times. Approvals launch VIKING Nadiro into new markets, shorten delivery times. New lifeboat release systems and bracket type approvals for VIKING Nadiro SOLAS products are extending the company�s core capabilities beyond cargo to offshore and passenger segments � and speeding up delivery times. Recently developed straight and bent brackets for VIKING Nadiro's SOLAS products have achieved global type approval through DNV, enabling the company to service a wider range of customers. At the same time, the approvals allow the company to slash more than a week off the time it takes to install and service its products. "We can now perform servicing for customers, for example, in the offshore sector, or ro-ro ferries with larger lifeboats than is typical of the cargo market where our success was built," says Henrik Helsinghof, Director, VIKING Nadiro. "And we've made a significant difference to the time it takes to provide a complete, ready-to-go installation, or to conduct component exchanges during servicing." Nadiro's range comprises three main lifeboat release and retrieval (LRRL) systems. Its DIB 32 product caters for smaller lifeboats, and has been installed on numerous occasions since being released in the summer of 2014. One step up, Nadiro's DIB 75, currently under development, is aimed at medium-sized crafts, and will be ready for commercial release in January. Finally, for the larger lifeboats, the company's soon-to-be-released DIB 125 is now in process to attain DNV approval. The DIB 125 is expected to be both DNV and USCG-approved, and ready to go to market by mid-November this year. All three products will also be available in a single-point version, requiring only one instead of the conventional two sets of hooks, and enabling them to be used, for example, for rapid deployment rescue crafts. Current regulations for many lifeboats reckon with a weight of 75 kg per passenger, meaning Nadiro's DIB products can be used to launch lifeboats carrying up to 150 passengers. "We're seeing a trend, however, of specific customers reckoning with an increased individual passenger weight," says Henrik Helsinghof and continues: "Norway, for example, is already above 90 kg, while others are looking at 100 kg per passenger. 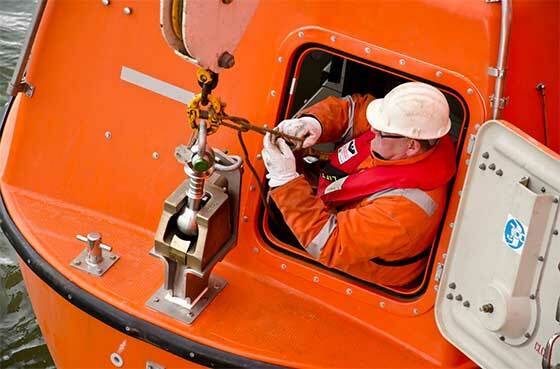 Hook performance, of course, isn't affected by this, but the trend heralds changes in lifeboat capacities and deployment requirements that we are closely monitoring."